Deviled Egg Recipe That is a Family Favorite. Video Included! 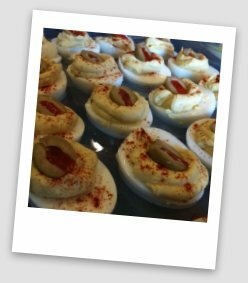 This Deviled egg recipe will quickly become a family favorite if your family loves Deviled eggs like our does. This recipe is done mostly by feel, but we have estimated the quantity of ingredients for the first time, just for our friends like you! We (I should say my wife) did ten eggs which result in twenty Deviled eggs. We also show you how to make a simple pastry bag to neatly place the creamy yolk filling into the egg. In this video, I am simply the video guy. Please watch it as it does a good job of showing the steps and exhibiting how the creamy end product should look. The quickest way to screw up your Deviled eggs is to boil your eggs incorrectly. Have you ever tried to pull the shell of a boiled egg only to have it stick to the egg and rip the egg apart? There is a specific technique here, which I will describe, but which also is explained in the video. 1. Place the eggs in a single layer at the bottom of a large pan. 2. Fill with water so there is 1 to 2 inches of water above the eggs. 3. Bring to a rolling boil slowly, preferably over medium-high heat. 4. Let them boil for 1 minute, then turn off the heat and cover with a lid. Let sit for 15 to 20 minutes. 5. Peel each egg and cut in half lengthwise. 6. Spoon out the hard yolk and place in a large mixing bowl. Place the egg whites in a single layer on a cookie sheet or a baking dish. 1. Mash the yolks well with a fork. 2. Add 3/4 to 1 1/2 cup of Mayonnaise. Experiment until you like the consistency. 3. Add your favorite mustard, 2 to 3 Tablespoons. 5. Pepper to taste, 1 teaspoon or so. 6. (Optional) Hot sauce to your taste is also delicious. Place yolk mixture in a plastic bag. Snip a corner of the bag with scissors and squeeze the yolk mixture into the egg whites. Sprinkle with paprika and place a 1/2 of a sliced olive on each Deviled egg. Leave Deviled Egg Recipe and Return to BBQ My Way Homepage.